BMI and/or Dress Size I don’t like being defined by a number but BMI is 30. I started running at age 50, I wanted to find a form of exercise I enjoyed. In October 2011 I was 21 stone and began my lifestyle change. I had lost 5.5 stone when I decided to try running. I was determined to age disgracefully and decided I needed to be healthy to do so! No! I hated PE – I was a chubby kid and the gym with all those bars and ropes terrified me. It’s my down time. Running is great and portable. You can do it anywhere. I’m a bit of a lone wolf and I like the idea of doing something outside, on my own, on my terms. I am competitive against myself so I am never without a challenge! 3 times a week, usually two 5 ks and a longer run on Sunday – the length of that depending on what I am training for. No – I need one locally on a Sunday as Saturday is impossible for me. Yes! Hence my runs mainly being at 5am on a weekday morning! I’ve had name calling and that kind of thing. Having a family member who always thinks I’m going to have a heart attack!! I think I worry about the strain and the toll of my joints but I listen to my body and to my physio if I get hurt. I have a couple really – to get 9 mph splits resulting in sub 30 5Ks and sub 60 10Ks – ultimately the London Marathon – who knows?! Running frequency, I think running in itself is important. Although I have to say I have a huge sense of achievement having run a half marathon so maybe distance is more important to me than I realise. I’m not sure if I’m honest. One thing about being overweight is that you tend to want to remain invisible, so that’s a tricky one. Themselves – lack of self esteem and self confidence and also to some extent society, not all runners look like Jessica Ennis! Baby steps! Invest in a good sports bra, get good running shoes and get your gait analysed. Two years ago I was 50 and started with a C25K app and now I’ve run a half marathon. Anything is possible! I have a motto – Never Surrender, Always Believe. It’s a fantastic concept, virtual races are great and I think it’s nice to know you’re not alone. Reading about other (normal) people’s achievements, knowing you can go somewhere for advice and not feel like you’re asking a silly question. I have to say I have found the running community on the whole have been fantastically supportive. 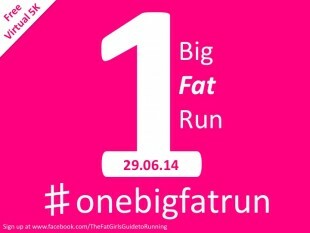 ← What d’ya call 20 fat ladies running in a park? Well done, Sue! Thank you for featuring her! I just turned 50 myself, and am halfway through a C25K program. Taking up a new fitness program at my age (and size) was a bit daunting. This blog serves to inspire me in so many ways, and I appreciate it each day!